President Trump was accused of leaking classified information. Turns out it was fake news. Do you remember when Hillary leaked classified information during a debate? During a presidential debate with Donald Trump last year, Hillary Clinton leaked some extremely classified information. There were millions of viewers tuned in for this debate. The military let it be known that they were “not exactly thrilled” when Hillary Clinton leaked some extremely classified information. Then it turns out that just saying the classified information to a national audience wasn’t enough. Hillary Clinton took things a step further and tweeted out the classified information. 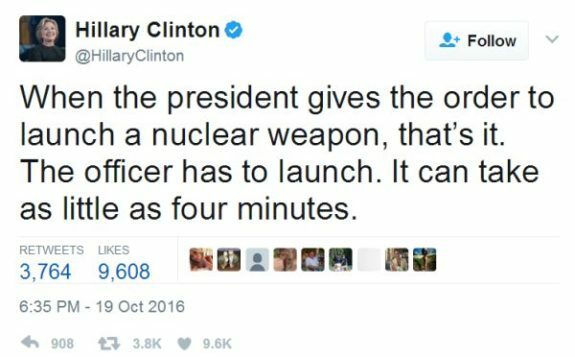 To this day, the tweet is still active on her Twitter account. When the president gives the order to launch a nuclear weapon, that’s it. The officer has to launch. It can take as little as four minutes. As you probably remember the liberal mainstream media gave Hillary a complete and total pass for this complete blunder. Since they were all working together on the same team, it made sense for them to just ignore it. President Trump has handled the classified information leak accusation with dignity and hopefully this is a sign to come.